Last Friday night, I spent my final hour before Hunter Dumped Us Here, Rally Cap, Life Lessons, and Real Friends wandering around a monstrous aircraft-hanger-turned-antique-mall (one of the only other interesting places to visit in Burnsville other than the Garage). I’d found a decent copy of Prince’s out-of-print Chaos and Disorder at the bottom of a stack of CDs, but I didn’t bring any money with me, so I had to walk out without it. I was irked, to say the least. Even now as I’m writing this a week and a half later, I’m still kinda irked. I hope it’s still there. Anyways, when I arrived at the Garage to work my shift at the street team table (we hand out candy to people who sign up for our email list and post videos of the show to the Garage’s Snapchat—sounds like a hard job, right? ), I was still irked. I also went in not knowing any of the bands. Good recipe for some deep, thoughtful critical analysis right there! Nonetheless, Hunter Dumped Us Here managed to cheer me up a bit, even though I had just been forced to abandon my only true friend in the cold, barren hellscape that is Burnsville. If you shut Ben Folds and a Bluetooth speaker inside a suitcase, spent a full month playing Vans Warped Tour™ compilation albums through the speaker at maximum volume, released him, and told him that unless he wrote and recorded a full album for you on the spot you’d throw him back in the suitcase, you’d probably get an album that sounded a lot like Hunter Dumped Us Here. In a good way. Next there was Rally Cap. Rally Cap was undoubtedly the star of the entire show. High energy, keen melodic sense, wacky dance moves—what more could you ask for? They also opened with “She’s My Cherry Pie”—hard to go wrong after that. However, the most important part of Rally Cap’s equation was their overwhelming charisma. I admired that the lead singer was just a singer, and didn’t play guitar or piano or anything like that while he sung. That’s underrated. Aspiring lead singers take note: when you’re not strapped down with an instrument, you can engage a lot more with the audience, and therefore be a lot more charismatic. Take me for example: I’m stuck behind a computer and convey no charisma through my writing whatsoever. I suppose that’s a bad example because it implies that I would actually be charismatic if you met me in person, but you get the idea. So. Life Lessons. Really didn’t take much away from this set. I guess there was that one time they played a Slayer riff while fooling around between songs. That was cool. I’m glad they listen to Slayer. Slayer’s a good band. More people should listen to Slayer. That’s a life lesson. Then again, everyone in the crowd was having a great time, laughing and smiling and singing along and whatnot, so maybe I should just shut up. You don’t see that kind of thing happening at a Swans show. Next band. Real Friends’ music didn’t really do anything for me either, but their set was entertaining as heck, so it was all good. This was one of those instances where the crowd was a hundred times more interesting to watch than the band. Real Friends is less of a “look down at your shoes while you half-heartedly mutter our angsty lyrics through your sobs” band (a lá American Football) and more of a “triumphantly pump your fist in the air to major chords while you scream along to our angsty lyrics” band. The surprising thing was, despite being all sunny and happy, they still managed to incite nonstop mosh pits and crowdsurfing throughout their set. When the lead singer first yelled “c’mon guys, let’s get a circle pit going” I started to laugh until lo and behold, the audience actually complied. The thing must’ve had a twenty-foot diameter, which, in relation to the size of the venue, was massive. 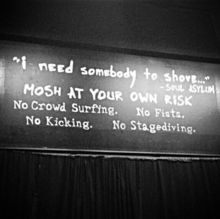 There was also a lot of ill advised stagediving (RIP the “I need somebody to shove” sign), which reached its apex when a young woman climbed up on stage, crossed her arms over her chest and, standing up perfectly straight, decided to fall (not jump; fall) face-first into the crowd. I didn’t know whether to laugh or send for help. Fortunately, the crowd caught her and begrudgingly helped her get back on her feet. The less concussions the better, I suppose (official mission statement of The Garage right there). If you take away anything from this review, it should be the fact that I don’t know anything about pop-punk, much less how to write about it. It’s not like it’s a new genre for me or anything—a lot of my friends are Warped Tour diehards who don’t hesitate to blast the stuff around me whenever we hang out. I guess it’s just that I’ve never listened to it from a critical angle before. I certainly don’t mind the genre. Once in awhile I’ll even find a band I dig, like Rally Cap. 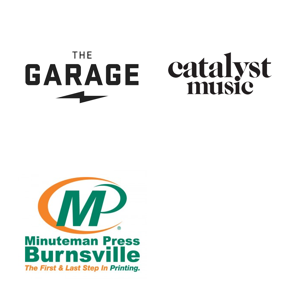 Going forward as a writer for Garage Music News, I think that I have an interesting musical journey cut out for me. I promise to keep an open mind as long as you guys promise not to dox me if I say something dumb. Deal? Deal.